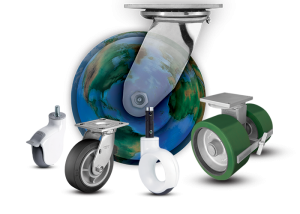 Colson Group is the largest manufacturer and distributor of caster and wheel products in the world. 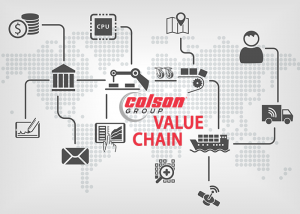 Over 1,600 global employees support Colson Group’s leading product portfolio and proprietary global value chain. World renowned brands, such as: Colson, Albion, Shepherd, Jarvis, Rhombus, MedCaster, Revvo, Pemco, Faultless, and Bassick are manufactured and marketed around the world through Colson Group’s 25 global facilities – where over 192,000 products are shipped out every day. Our commitment to mobility reaches far past the sale, and starts by ensuring the proper product is specified or designed to meet the specific requirements of each application. Leveraging our robust product offering, leading engineering knowledge, proprietary manufacturing footprint, and world-class partnerships – we deliver unparalleled support and value to each customers’ unique performance, design, and logistics needs. From your local supermarket and hospital, to the facilities that build our cars and planes – Colson Group keeps industry moving, businesses more efficient, and people happier and safer. The most complete product offering in the world. Our brands provide over 400 years of market-proven experience and expertise for every industry and application. Our innovations have led to some of the most trusted, highest quality, and advanced mobility solutions today, with dynamic load capacities ranging: 40 lbs. (18 kgs.) to 100,000 lbs. (45,000 kgs.). What makes us unique? Our proprietary global value chain enables us to provide solutions around the world, competitively and like no other company can. This is possible through global manufacturing and supply chain leadership, product application and design innovation, customer service leadership, and the largest distribution network in the world. Our people make the difference and drive our success. Over 1,600 worldwide employees work hard everyday to ensure we provide the best possible service and quality, challenge standards for safer and more innovative designs and manufacturing processes, optimize material and energy consumption, and collaborate as a global team to get the job done. To be the global manufacturer of choice for caster, wheel and mobility solutions. To anticipate and translate customer mobility needs into the optimal solutions portfolio. With an unparalleled legacy of product, service, and corporate responsibility dating back to 1885, Colson Group’s brand history is lined with innovations that have helped define today’s global caster marketplace and product advancements. To continue our growth and leading market position, our global strategy is “One Colson”. We seek a worldwide, corporate alignment to best position us for future growth. Through operational excellence, an optimized product portfolio, and continuously improving our systems and processes, we will remain the global leader in casters and wheels. We plan to leverage our global capabilities with value-focused world-class partnerships to bring our robust, new product capabilities closer to our service markets. Our Human Resources mission revolves around providing our associates with opportunities for growth and development, competitive total compensation, and an engaging and safe work environment. Learn more about the Colson Group Code of Conduct.